How to Fix Error Code 8003 on Mac? Home »	Fix » How to Fix Error Code 8003 on Mac? Issue: How to Fix Error Code 8003 on Mac? I cannot empty the Trash on my Mac. It delivers an error code 8003. What is the problem? 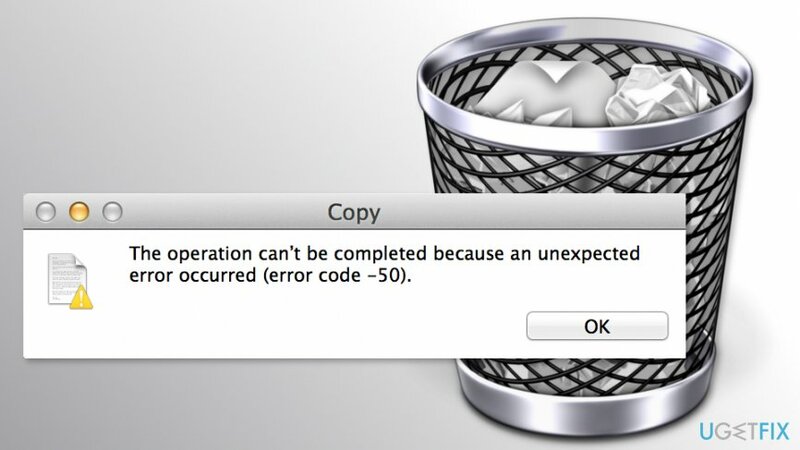 Error Code 8003 is an error message that might pop up on your Mac’s screen when you try to delete entries from the Trash. It’s an annoying error that prevents you from removing unnecessary files or programs that just take place on your device. The operation can't be completed because an unexpected error occurred (error code -8003). Neither hitting “Stop” nor “Continue” buttons help to solve a problem and empty the trash. Sometimes restarting the device helps. However, this simple solution not always works. Though, there’s still a way to fix error code 8003 on Mac. Usually, the error shows up when users try to delete something from the Trash Can that they do not have permission for or these files are locked. However, other problems might also be responsible for this annoying problem. If you ended up on this part of the article, we assume that restarting computer did not help to get rid of the error and remove entries from the Trash. However, there are several more ways to fix 8003 error. If the error is triggered by some third-party applications, you should start your computer in Safe Mode in order to fix the problem. Turn off and then turn on Mac. During the startup hold down the Shift key on the keyboard until the Apple logo shows up. Then release the keys. In the appeared screen, choose Safe Mode and hit Enter. Now Mac will run in Safe Mode. Try to empty the Trash. If you still cannot perform this task, try the second method. 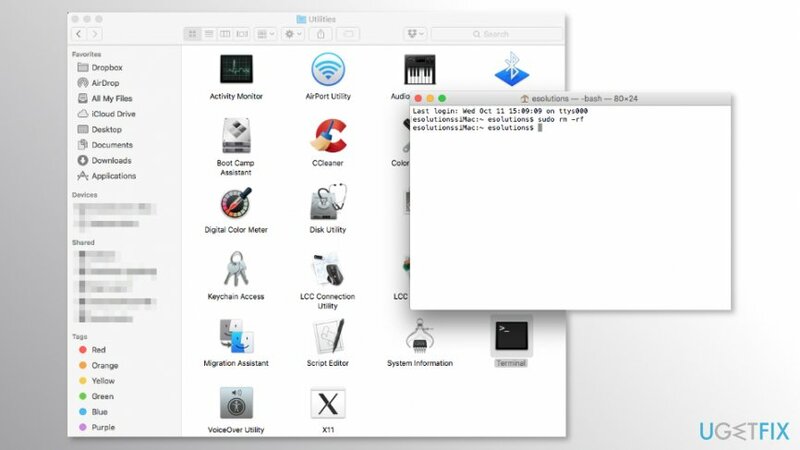 It’s one of the easiest ways to fix Error Code 8003 on Mac. When you choose Empty Trash option, you have to hold down the Option key on the keyboard. Note that these actions have to be performed simultaneously. Hit Command + Option + Right Arrow on the keyboard. Click Command + Option + Right Arrow again. 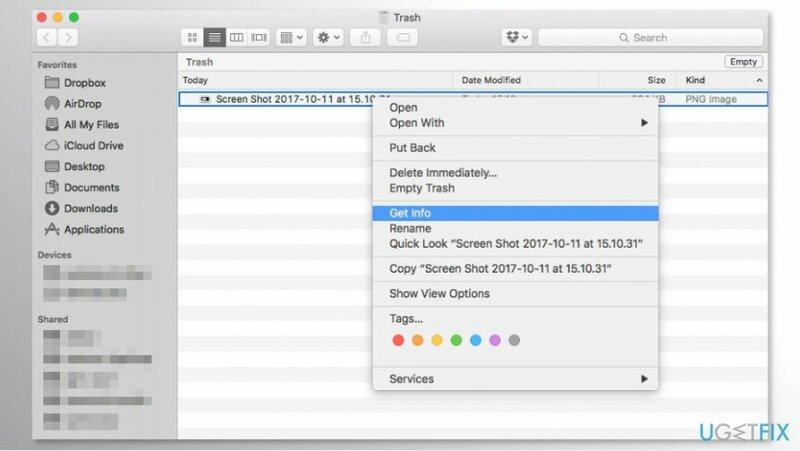 Right-click on an empty space and choose Empty Trash option. Terminal is a built-in applications that allows executing various command on Mac OS X. Executing a command might help to fix 8003 error too. Go to Applications -> Utilities -> Terminal. Type your password if necessary. Then drag files in the Trash folder to the Terminal window. Click the Key button on the keyboard. Right-click a file you want to delete. Click File menu and go to Get Info. When File info dialog shows up, click the Sharing and Permissions heading. Once it’s done, you should be able to empty the trash without Mac error 8003. ^ Keir Thomas. How and why you might need to boot a Mac in Safe Mode. Macworld. Latest Apple, Mac and iOS news, help and advice. ^ Where is the Option Key on Mac Keyboards?. OS X Daily. News, tips, software, reviews, and more for Mac OS X, iPhone, iPad. 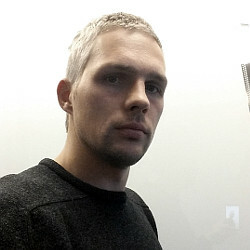 ^ Mac Terminal. Techopedia. IT terms dictionary.